iFoneMate is a professional data recovery program. It recovers lost data (even deleted) from iOS devices. Data includes messages, music files, notes etc. 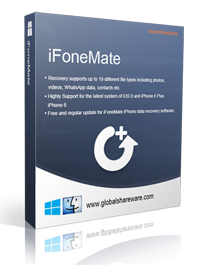 iFoneMate iPhone data recovery software can be used on devices including iPhone, iPads and iPods with iOS 7.0 and below. The process is simple. All users have to do is click start and select what they want to recover. It can be used to extract anything ranging from whatsapp messages, to restore lost iPhone photos and saved and back up files to phone contacts. The program offers three methods for recovering data. These include: recovery from iOS devices without any backup, recovery from iTunes (back up files) and recovery from iCloud (back up files). The next step is to click “Start Scan” this will begin the scanning process for lost and deleted data. When the scan is complete, all the items from the category you choose will be displayed. You can also preview the data before saving it on your system. On installing and downloading iFonemate, select the “Recover from iTunes backup file” mode. Select the category of the lost data and begin scanning. Once the scan is complete you will see all the data from the category you selected. These can be previewed and saved just like in the previous mode. Begin with logging in to your iCloud using your Apple Key and Password. After logging in, you will be guided to the interface where you can choose the option “Recover from iCloud back up files”. The backup files will be displayed. You can them choose a category and begin scanning. Preview the data and extract by clicking “Recover to PC” and save it to your PC or Mac. The program is a lifesaver for those who may have accidentally deleted messages or contact details from their phones. It also helps get data after your device has been damaged or had an issue with viruses. Important data from work or classes that you may lose can be easily recovered.This recovery program for recovering messages is compatible with iOS 8 devices like iPhone and iPhone 6+, making iPhone 6 data recovery possible. The trial version of the program can be downloaded for free, while the full version can be bought online. Next Entry: Is NSA using a young Belgium guy to track people’s expenses through the social network called PEEPME ? Next Entry Is NSA using a young Belgium guy to track people’s expenses through the social network called PEEPME ?